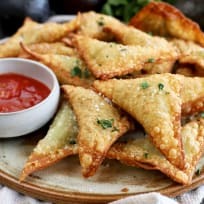 Guacamole Wontons are the handheld version of my favorite food, that’s also been fried. The golden brown, crunchy exterior wraps the guacamole in a warm hug. Be sure to make them for the big game! Crock Pot Queso has two kinds of cheeses and salsa verde for a pop of zesty Mexican flavor. Watch this appetizer disappear at your next get together! Tropical guacamole is a way to escape to the islands, but without that pricey plane ticket. A combination of pineapple, papaya, mango, and coconut makes this dip sweet and savory. It’s an ideal snack or a killer topping for chicken and carnitas tacos! 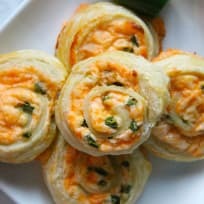 Bacon Cheddar Pinwheels are so versatile! You can make them lunch, dinner, or an easy app for your next dinner party. Toaster oven potato skins are crispy, cheesy bites of baked potato goodness. 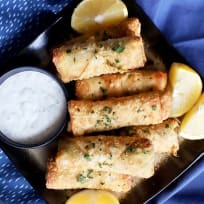 They’re the perfect appetizer for watching the big game or a fun dinner for two! Buffalo chicken celery sticks take celery to a whole new level! It’s sure to jazz up plain celery for sure and put a smile on every Buffalo chicken lover’s face.